McMillan takes the truths of the Easter story and gives us a new lense to ponder them through. Why suggest one of the most famous and popular Christmas songs of all time? First of all, I find this song doesn’t show up in many hymnals, so many congregations may have to look elsewhere for resources for it. I wanted to provide those resources (the lead sheet for this song is free). 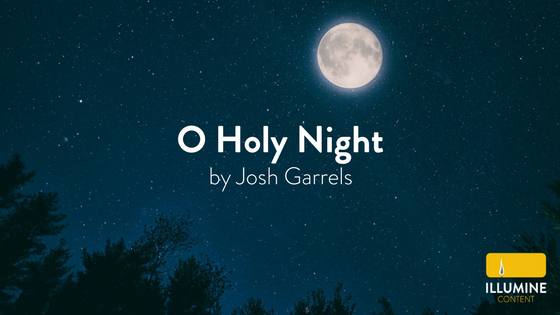 Secondly, it’s a song that can be performed in a number of different styles and arrangements and I wanted to share one of my favorite versions by Josh Garrels. A few years ago, the Christmas Eve sermon at Illumine centered around a phrase from the first verse: “Till he appeared and the soul felt its worth.” That’s this song in a nutshell. The song, both lyrically and musically, does an excellent job of capturing the broad range of emotions associated with the birth of Christ. There are quiet contemplative moments and there are massive joyful moments. When we fully understand and appreciate what happened when Christ came to earth, we can’t help but (as the chorus says) fall on our knees. Out of shame. Out of joy. Out of sorrow. Out of thankfulness. Admittedly, this song has a fairly narrow range of uses. While you could certainly try to use it sometime other than Christmas Eve or Christmas Day, it would certainly be a little strange. While it may lack in occasions for use, it does not lack in arrangements. We have provided the free lead sheet that Illumine uses when performing it, but the lead sheet does not limit the different styles and instrumentations you can use. Despite being one of the more recent additions to corporate worship, it has been my experience that Confession is one of the more beloved parts of a worship service. Many parishioners I have spoken have expressed that the service feels incomplete without it. 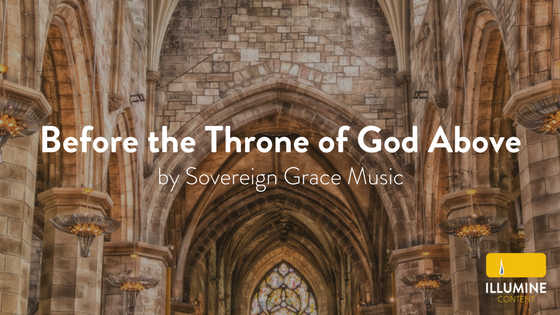 While we are certainly not commanded to have Confession in corporate worship, I think the feelings of these parishioners reflect that of Martin Luther who saw the benefit of Confession “for the sake of Absolution.” This song paints a vivid picture of how and why we receive that absolution: through our great High Priest. This hymn is a beautiful expression of Subjective Justification. Because of Christ, I have a perfect plea. Christ, my great high priest, intercedes with the Father on my behalf. He made an end to all my sin. With so many personal pronouns, this song could easily have fallen into the trap of being self-focused and trivial. However, the lyricist never loses focus of Christ. The lyrics repeat over and over the works that Christ has done for me. While the personal pronouns are there to bring me comfort, the focus is still on the one whose works give me that comfort. The song is at it’s best when used in conjunction with Confession and Absolution. After the congregation is assured they are forgiven, they can sing this song reminding them of where that assurance is rooted. It can also, for similar reasons, be used in conjunction with Communion. While the lyrics were written in the 1800’s the melody most often used with it today was written in 1997 by Vikki Cook. Cook’s new melody is extremely accessible and easy to pick up. How can we help but sing our praises to God after contemplating the depth of what he has done for us through Christ?